In a joint message with UN Secretary-General, Mr Ban Ki-moon, Bokova said, "Freedom of expression is one of our most precious rights. It underpins every other freedom and provides a foundation for human dignity. Free, pluralistic and independent media is essential for its exercise." UNESCO leads awareness of World Press Freedom Day, and has a rich trove of resources on their site. According to the Bokova's statement, "last year, UNESCO condemned the killing of 62 journalists who died as a result of their work." Also highlighted by UNESCO is that in our current age of digital storytelling, "more online journalists, including bloggers, are being harassed, attacked, and killed for their work." Yet, "regardless of the regard you may or may not have for the news media," said vice president and executive director of the First Amendment Center, Gene Policinski in a column recently. "Pause for a moment...to honor those who gave their lives or their liberty so that others might better know about the world around them." 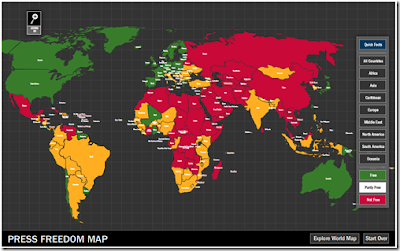 Below is the Newseum's interactive Map of World Press Freedom.